Hi, my name is Danny. 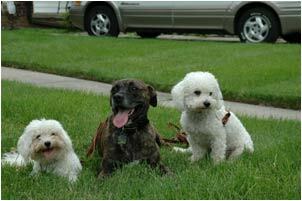 I�m the brindle dog you see next to the very cute Bichon Frises. You can�t tell from the picture, but I used to be aggressive towards dogs. Here�s my story: I found my forever home five years ago and was very excited to be rescued! For the first time in my life I was loved and cared for by a human companion. After a year or so, my human came home with a friend for me. Her name is Polo. Polo didn�t mind other dogs and she soon became my better half. Polo and I loved our human very much but she never taught us how to behave. As a result, we became frustrated with the lack of leadership and started to act out in ways that were less than desirable. I became very aggressive with other dogs and Polo�well; she just did whatever she wanted, whenever she wanted, regardless of how upsetting it was to our human. Anyway, my aggression became so severe that my human could no longer take me for a walk around the neighborhood. I felt like I wanted to hurt every dog I came across. I remember my human constantly shouting at me and pulling on the leash. Sometimes I was forcefully pulled back from the other dogs that were passing me by on the street. We had a couple trainers come to the house but none of them could break me of my aggression problem. Then one day, my bad behavior made a turn toward an unsuspecting target and Polo followed my lead. After seeing this, my human made an appointment for Polo and me to be euthanized. I remember her tears that day. They were accompanied by long hugs and several good byes. It was such a sad day. Her energy was so painful to absorb. Polo and I didn�t mean for this to happen. We didn�t want our human to look so sad and to feel so desperate. We wanted to tell her that our love for her just wasn�t enough to make us behave the way she wanted us to. We needed guidance and we needed to respect her. We wanted so badly to let her know that respect would make us stop hurting others!! Well, as luck would have it, my human suddenly remembered the name of a very successful dog trainer named Vladae Roytapel. She knew that Vladae would be her last attempt at saving our lives. So she found his phone number and made a call to A.C.T.. That call ended up changing our lives forever. Here�s the good part: A few days after the call, Vladae came to our house and evaluated Polo and I. He told my human that her lack of leadership was the cause of our misfortune. He told her that if she was willing to take the time and follow his instruction that we wouldn�t have to be euthanized. Polo and I were thrilled at the chance to live a peaceful life and our human began to smile again! Needless to say, the very next day our appointment to be euthanized was cancelled and never rescheduled! 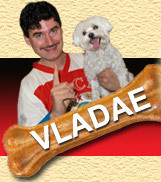 Vladae taught our human so many things about obedience training and canine behavior. He was so patient with her and he was so gentle, yet firm with me and Polo. Our human finally became a consistent leader and our behavior improved dramatically. Polo and I are living proof of Vladae�s ability to rehabilitate dogs with behavior issues. My human is living proof of Vladae�s ability to teach people how to become a pack leader. There�s an expression humans like to say, �A picture is worth a thousand words.� Please look at the picture of me and the Bichons. You can see the peace in my eyes. You can see that I don�t want to hurt these dogs. This picture proves that Vladae can perform miracles!! This is how my story ends.